Sometimes my wife and I go love to eat vegetarian food. One of our favourites on the BBQ is Halloumi cheese or as the kids call it ‘squeaky cheese’. Setup your BBQ for Direct Cooking, you may want to leave an area with no coals just as good practice incase you need to move the food to a cooler area of the grill. Chop all your veg ready for the stir fry. Put your wok onto the grill and put some Olive Oil in to heat up. Put your Pine Nuts in to toast for about a minute before adding all the veg. While the stir fry is cooking cut your Halloumi into about 1/2 cm slices and put them straight on the grill turning after a couple of minutes. Keep the stir fry moving around in the wok. 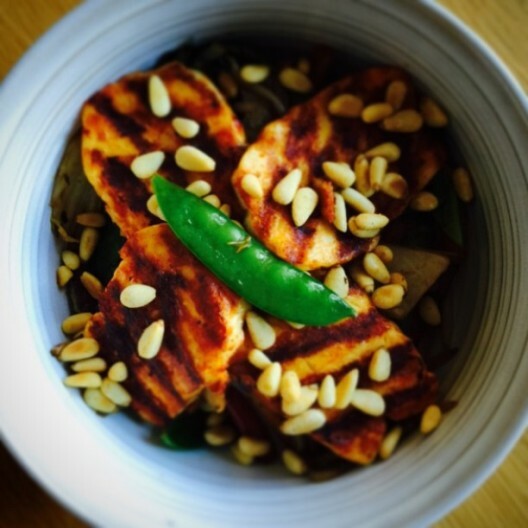 Serve the stir fry in a bowl and then place the Halloumi on top.